Travel through one of the most photogenic countries in the region to capture the unique faces and landscapes in some of Myanmar’s best-loved destinations. Yangon is a burgeoning metropolis with a kaleidoscope of five million people who are a mix of Burmese, Chinese and Indian. As a former British colony, Yangon is filled with architectural gems from the colonial era. Take a walking orientation tour of the city with an expert from the Yangon Heritage Trust. Learn about the city’s history and marvel in its architecture with opportunities to photograph inside the heritage buildings. In the afternoon, take the Yangon Circular Train used by locals to commute around town. The train journey is an excellent way to capture the rawness of everyday life while being able to interact with the local people. Rise early to visit Shwedagon Pagoda, Myanmar’s most important and impressive place of worship. Arrive before sunrise to set up and observe the silent religious rituals. Early mornings are an opportune time to capture the spiritual practises of the people and the serene atmosphere. After breakfast, we are joined by a local photojournalist for a street photography walk. As a resident of Yangon, the photographer has insider knowledge on interesting places and people to photograph. We visit markets, neighbourhoods, and local hangouts to gain a real sense of the city and its people. Formerly known as Pagan, this ancient town was the capital of several Burmese kingdoms and is home to more than 2,000 temples dating as far back as the 11th century. Visit several impressive temples and pagodas such as the Ananda, Shwezigon and Sulamani. Rise early for an exciting ballooning experience over the vast temple plains of Bagan. The bird’s eye view offers stunning photographic opportunities as well as breathtaking vistas of the sunrise. After breakfast, visit an authentic village to observe the daily life of local villagers. Watch them climb up the toddy trees to obtain the extract, then see how they make toddy juice and wine. Stroll around the village with ample opportunities to photograph scenes of rural daily life. 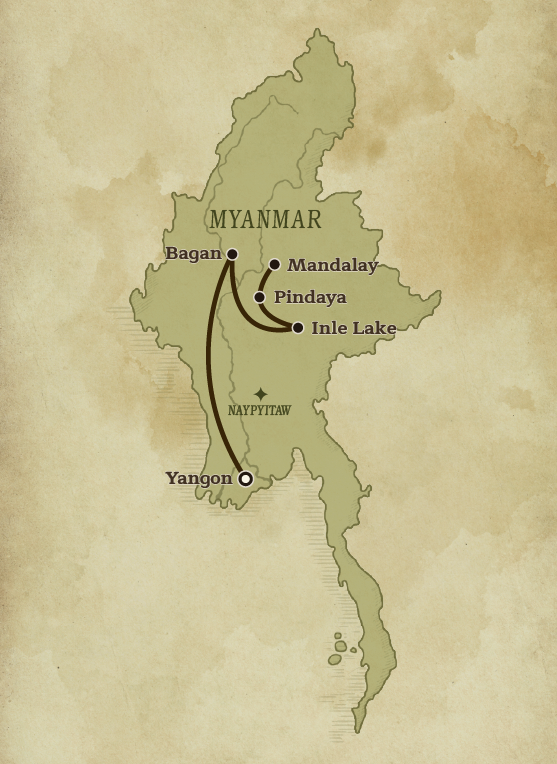 A short flight from Bagan takes you to Heho, gateway to Inle Lake and the Shan region. Explore scenic Inle Lake, Myanmar’s second largest, by boat as you pass floating gardens and stilt houses. Inle is also where you will find the unique one-leg rowers who display amazing balance. Your boat will stop with time to photograph the magnificent image of Intha fishermen against the backdrop of the cascading Shan mountains. In the morning, visit the 5-day rotating market which changes location depending on the day of the week. The rotating market serves as a central market for the population around Inle and attracts numerous ethnic groups from the Shan mountains. Stroll around the colourful bazaar and capture the lively atmosphere including the intriguing people and costumes from different ethnic hilltribes. Afterward, visit the Intha village of Khaung Daing known for the production of soybean cakes and noodles then hike to a hilltop temple for panoramic views of Inle Lake. Enjoy a scenic drive to Pindaya with opportunities to stop and photograph the colourful farms and rolling hills of the Shan Plateau. In Pindaya, visit the limestone caves that house approximately 6,000 Buddha statues of various sizes. Afterward, we go on a gentle, half-day hike along local trails with stops along the way at villages specialising in handicrafts such as pottery and paper parasols. A highlight of the day is spending some time with a Danu family who lives in a traditional teak house built in the 1930’s. A short flight from Heho takes us to Mandalay, the last royal capital of Myanmar. In present day, the city is considered the spiritual seat of the country, home to numerous notable temples and monasteries. 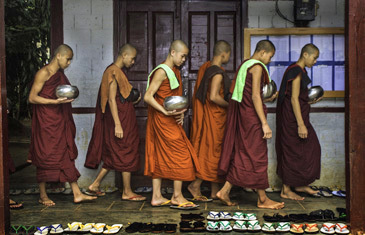 We visit an active monastery to capture the daily life of novices and monks. 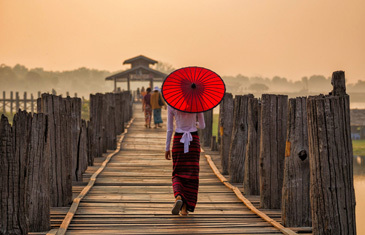 This evening, we visit U-Bein Bridge, the longest teakwood bridge and one of the most photogenic bridges in the world. We position ourselves on individual boats to photograph the bridge at sunset. Apertifs and champagne will be served on the boat after you’ve captured amazing photos of the U-Bein Bridge at sunset. Today’s excursion takes us outside Mandalay to the quiet village of Inwa to explore monastic ruins and pagodas. Visit an impressive teak monastery built in 1834, and notice the 267 large teak support posts as well as the intricately-carved wooden door panels. After lunch, visit Sagaing Hill and a few of the more interesting pagodas in this area, including Umin Thounzeh with 45 Buddhas lined up along a crescent-shaped colonnade.